A US technology firm has developed a drone that is able to aim and fire at enemies while flying in mid-air. The Tikad drone, developed by Duke Robotics, is armed with a machine-gun and a grenade launcher. The gun can be fired only by remote control, and is designed to reduce military casualties by cutting the number of ground troops required. But campaigners warn that in the wrong hands, it will make it easier to kill innocent people. The Tikad drone, available for private sale at an undisclosed price, has won a security innovation award from the US Department of Defense, and there is interest from several military forces around the world, including Israel, reports Defense One. According to the firm's website, two of the three co-founders of Duke Robotics worked for the Israel Defense Forces and the third at Israel Aerospace Industries. "As a former Special Mission Unit commander, I have been in the battlefield for many years," said CEO Raziel Atuar. "Over the last few years, we have seen how the needs of our troops in our battlefield have changed." Image caption The weapon can be fired only remotely by human control. However, robotics expert Professor Noel Sharkey expressed concern that gun-toting drones could make it easier to kill innocent people. 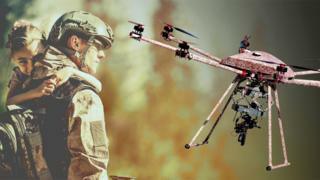 "Big military drones traditionally have to fly thousands of feet overhead to get to targets, but these smaller drones could easily fly down the street to apply violent force," he told the BBC. "This is my biggest worry since there have been many legal cases of human-rights violations using the large fixed-wing drones, and these could potentially result in many more." For the past decade, Prof Sharkey has been campaigning against killer robots, which are fully autonomous, computer-powered weapons that would be able to track and select targets without human supervision. Together with the Campaign To Stop Killer Robots, a coalition of over 60 international NGOs including Human Rights Watch, Amnesty International and the Nobel Women's Initiative, Sharkey has been lobbying the United Nations to ban autonomous weapons. However, the machine-gun on board the Duke Robotics device still has to be controlled remotely by a human operator. According to Prof Sharkey, some US military officials are concerned that although the US might follow the laws of war, terrorists could easily look at drone innovations and copy the idea to kill innocent people. "We already know that Islamic State is using drones laden with explosives to kill people. What's to stop them from getting their hands on this? Copying has not been possible with big military drones, but once you get the idea that you can strap automatic weapons onto one and operate it remotely, that's very much easier," he said. "This type of weapon is another dangerous step towards the development of fully autonomous weapons that could hunt down targets and kill them without human supervision." Would you get on a pilotless plane?